If you are on any Windows operating system, there is one thing that I can almost guarantee you’ve thought of – viruses. Previously, you have had to go out and trust free software solutions, or trust a pay solution that usually had a yearly fee. Well, no more my friends! Microsoft has released their own free solution that promises to crush the competition. 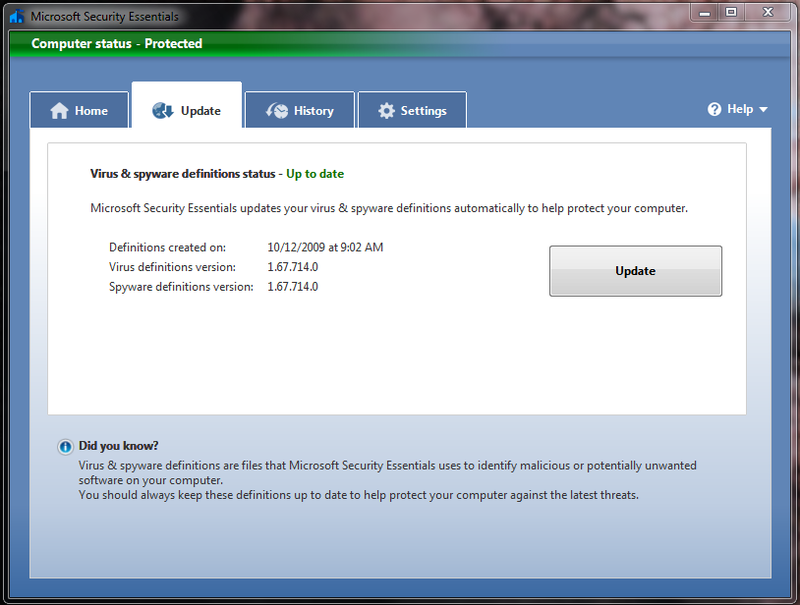 Microsoft Security Essentials (MSE) is a replacement for Microsoft’s pay antivirus, Windows Live OneCare, as well as their spyware/adware remover Windows Defender. It is available for home use only, on standard workstation operating systems (XP SP2 and higher (32-bit only), as well as Vista and Windows 7). The only other requirement is that your computer must be able to pass the Windows Genuine Advantage (WGA) test. Microsoft is currently planning an enterprise product along the same lines that will be called Microsoft Forefront, which will likely be much more inclusive than the home client. Performance wise, MSE is semi-unfortunately slow. It’s not a true curse, but the speed (or lack thereof) is not necessarily a downside. While it is true that a typical Full Scan can take several hours, this type of scan only needs to be performed once at install, and potentially once per month after. Unlike many scanners who strive to be the fastest they can possibly be, MSE attempts to take it’s time looking through any potentially harmful file and applying very accurate heuristics. Scanning through a documents folder containing .doc, .docx, .rtf, and other similar files as well as picture and video files usually does not take very long. MSE does, however, begin to slow when it comes across program files including .exe and .dll. The positive side to slowing down and carefully scanning the likely infected files is that it can be highly accurate with finding and removing malware. Through its advanced heuristics, I have had zero false positives with a bit over a month of use. Keep in mind that as many security experts will tell you, your antivirus is your second defense. You are your first line to keep your computer safe and away from the bad guys. If you download something and let it run, it’s usually too late for the software on your computer to do anything about it. 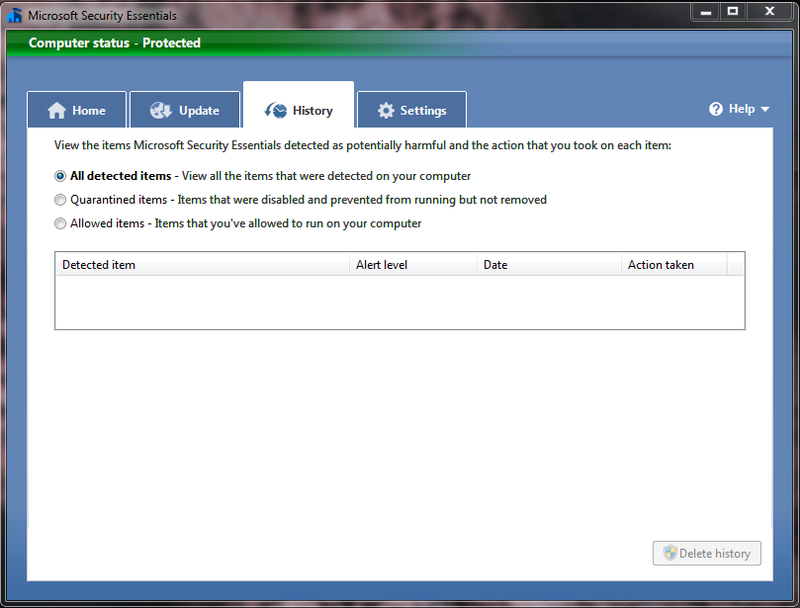 Microsoft Security Essentials - All of the settings available to the end user. 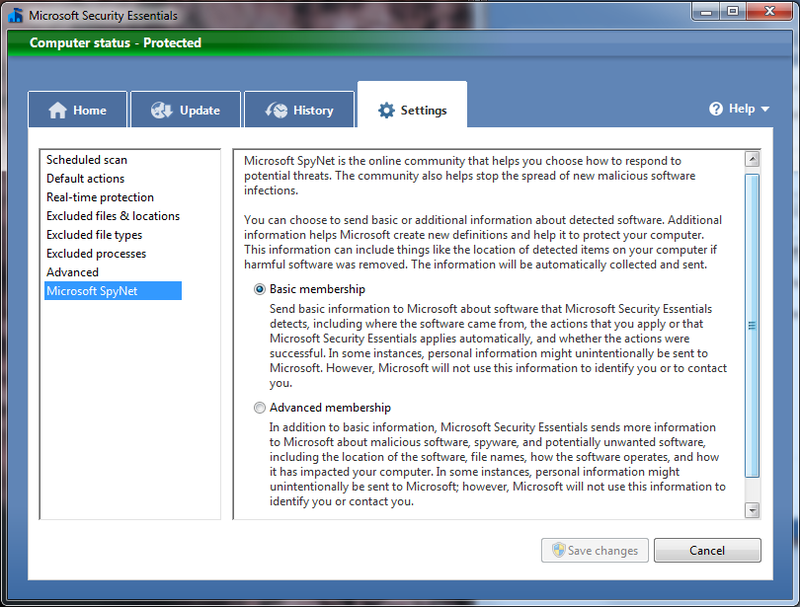 Microsoft Security Essentials - Microsoft SpyNet, the ability to help Microsoft in researching new viruses and improving heuristics. 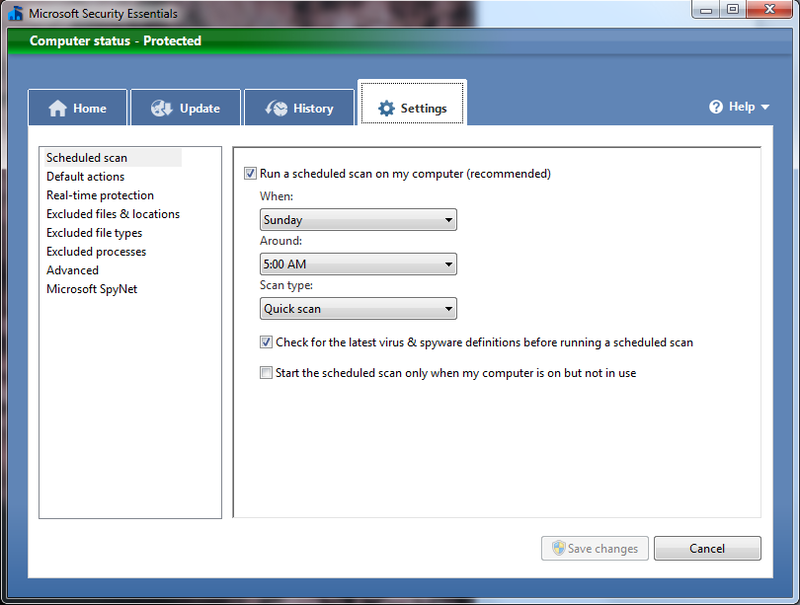 Each setting allows Microsoft to gather basic information about viruses and potential viruses it finds. Microsoft Security Essentials - You can manually update, but the program defaults to automatically checking and installing updates. This has changed recently, as I have not been asked in Windows Update to install updates anymore. I usually get confirmation before allowing the updates to occur, but this is not something I would bicker about. 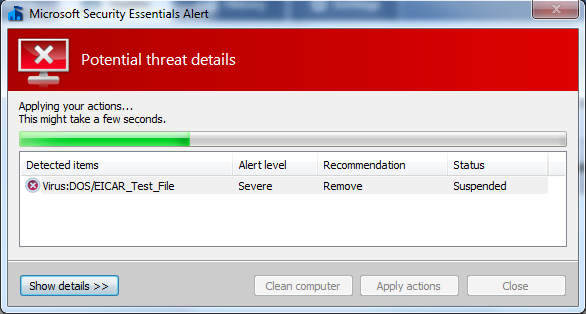 Microsoft Security Essentials - When MSE detects a problem, this notification appears in the lower right hand corner of the screen, just above the toolbar. It will stay on top of all windows until you deal with the problem, or have the program set to auto-quarantine potential problems. 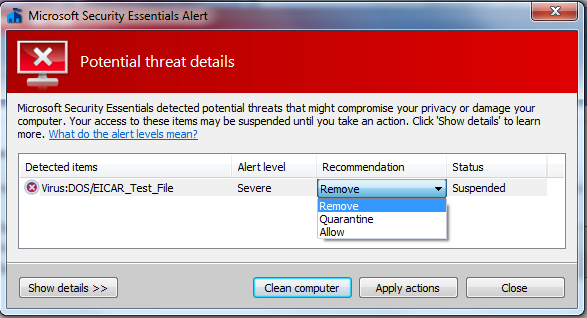 Microsoft Security Essentials - Once you have been warned, you have the option to either completely remove the file, quarantine the file, or allow the file. Microsoft Security Essentials - Once you have chosen an action, MSE will carry out your wishes. Though I have been quite pleased with my experiences so far, and would certainly recommend anyone still using a free edition of AVG, ClamWin, or Avast! to make the switch, I have had one friend not share this opinion. He is running on a x64 version of Windows 7 RC, and he says the performance is poor. I can’t verify this, as I have no reason to make the move to 64-bit, though this is something you may consider. Personally, I think the performance decrease was a combination of a different program running in the background along with playing a demanding PC game at the time. 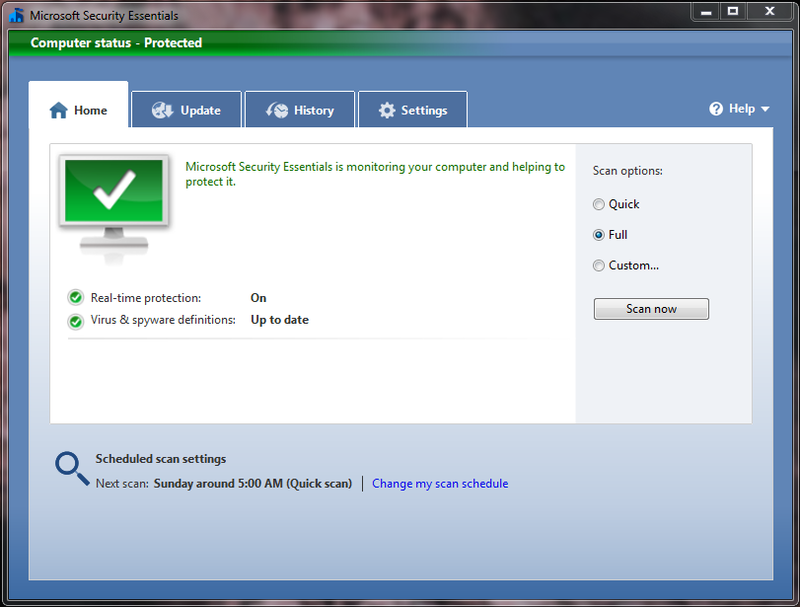 In any case, check out Microsoft Security Essentials and see for yourself! You can message me on Runewire, Twitter, or the Forums if you have any questions, or suggestions for future articles. This article is filed under Tech. You can follow any responses to this entry through the RSS 2.0 feed. Both comments and pings are currently closed. Heh, I did notice that is was kinda slow, but it doesn’t bug me. It bugs my friends, though. I’ll certainly show them this to prevent them from switching to Norton once again. I loved the article! You always have good ones. Nette Site! Der Post ist interessant. Danke dafuer. Anyone know what’s the best type of door for my apartment which will be good at keeping the cold air inside?